San Francisco: Chryslers decided that they need a halo car, you know something that sits up there to draw your attention to the brand. It doesnt have to be a model that sells in the hundreds of thousands. Dodge has the Viper. Plymouth (now gone) had the Prowler. Whats Chrysler got? The 300M? As nice as it is, the 300M really is not the halo Chrysler wants  heck, its a four-door sedan. So, Chrysler, in just 24 short months, developed the Crossfire. What is the Crossfire? It is Chryslers first 2-seater, its first real sports coupe but most importantly, at least corporately, it is the first real product of the Daimler and Chrysler marriage. The Crossfire is designed in the USA, on a German designed chassis, with a German produced engine and transmissions, and built by Karmann in Germany. Chrysler is expected to price the Crossfire in the high $30s. I found the Crossfire to evoke the future as seen through the eyes of someone in the 1930s or 1940s. There are retro touches but the overall effect is futuristic. The Crossfire is only available as a coupe, a fastback coupe. It is especially handsome in the front three-quarter view but is distinctive from any angle. The Crossfire is small; it has a wheelbase of 94.5", is 159.8" long, 69.5" wide, and only 51.4" tall. It is built on the Mercedes Benz SLK chassis but it looks bigger. The body has a lot of character lines. The hood has six (three per side) longitudinal lines that flank the beginning of a central spine. The rear window is tiny, in fact some may have problems seeing out of it. Up front is the same distinctive grille design and winged emblem seen on the Chrysler Pacifica. To aid the look of muscularity, the rear tires are P255/35ZR19 and the fronts are P225/40ZR18. Those are big tires. 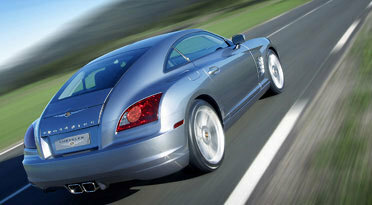 There is no mistake about it, the Crossfire is a masculine car. Inside, the Crossfire is a comfortable, if tight, transportation module. At 6 tall, I did not have any trouble feeling comfortable in the Crossfire but a taller driver, at 6 3" had just about no headroom at all. And, with the seat moved as far back as possible, the seatback would not recline enough to give the poor fellow a break. So, it was either scrape the roof or move the seat forward and bend his knees. Driving a Crossfire is not unlike driving a M-B SLK. Under the hood is M-Bs 3.2-liter, SOHC, 18-valve (2 intake, one exhaust), V6. It produces 215 hp and 229 lb-ft. You can order it with a 6-speed manual (my recommendation) or a 5-speed automatic. The Crossfire is rear wheel drive. With the manual transmission, the Crossfire weighs 3,060 lbs and increases by 24 lbs with the automatic, not a terrible penalty but weight is weight. Maybe because the Crossfires chassis started life as a roadster and now sports a fixed roof, it is incredibly rigid. Daimler Chrysler did not take anything out of the structure, they just added a roof. This rigidity makes for excellent ride and handling; if anything it is better than the SLK. I drove the Crossfire on some exciting roads to the east of San Diego, CA. Regardless of the transmission type, it was a real fun-to-drive car. The automatic uses Chryslers AutoStick, which virtually turns the automatic into a manual transmission with brains. The big, beefy tires held on regardless of the road condition. There are two tire types available on the Crossfire. The standard tires are Michelin Pilot Sport 2 with ZR-rated Continental All Season Performance tires optionally available. I drove on both tires and really could not tell the difference  but I never drove the Crossfire at its limit. I did drive through some snow and with the full time traction control there was never a problem.